The future of Zambia’s visual arts is glaringly bright and imaginatively energetic judging from the few samples that were displayed at the first ever National Schools Fine Arts Annual Exhibition held at the Lusaka National Museum from the 18th to the 23rd of August. Organised by the School Arts Association of Zambia (SAAZ) and sponsored by the Education Ministry, the exhibition drew participation from only eight of the ten provinces obviously owing to a few teething problems. When announced in schools, the call for participation required that the children depict “any aspect of Zambian life” and it demanded for schools to “Ensure that all art works done by pupils are original and supervised by the art teacher in charge”. As for the aspects of Zambian life, some pupils, or learners as they are called nowadays did not adhere to the rules and submitted paintings and drawings of their favourite Hollywood cartoon characters such as Tom and Jerry or comic book characters like Batman. It is either the children who submitted entries that did not conform were not supervised by their teachers, or they were just allowed the flippancy of childhood to throw in anything, much to the resentment of the adjudicators; “The advice is that next time schools participating in these fine arts exhibition should make sure that learners are guided on what is expected of them so that the standards of the works produced are at expected levels, ” Stated chief adjudicator Aubrey Moono in a report. That aside, all the learners submitted remarkable drawings, paintings, sculptures and crafts. In the crafts category, some of the beadworks, embroidery and basketry were so meticulous they were in fact market-ready. Similarly for the drawings and paintings, some of them could easily fit into any gallery space alongside practicing visual artists. As much as it might be unfair to single out individuals, a typical example of such work would be a pencil drawing by 18-year-old Kasama Boys pupil Alex Makasa entitled “Scramble For Land”. As an aspect of Zambian life, his title and subject matter are spot on because there is an apparent scramble for land in the country no wonder government recently announced an audit. 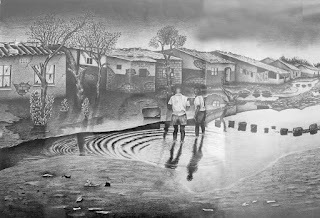 Then there is the execution itself, he depicts a flooded shanty compound with two boys standing in a large puddle, their reflections showing in the water’s ripples. Almost life-like, save for the proportions that rob it of photographic precision. A similar work is by his colleague, 17-year-old Simon Chela from the same school. Although it was listed as a painting, apparently it is done in coloured pencil. Entitled “Earning a living” it shows a tailor at his sewing machine, working away on a piece of torn cloth. Ironically, his shoes, shirt and roof of the house in the background are riddled with holes that need mending too, so it is hard to see what living is being earned here. This work too displays a free hand that executes work that again is none photographic in appearance suggesting these two learners (Makasa and Chela) were not working from photographs but rather from images in their mind, epic. According to the organisers, the exhibition was not meant to be a competition, however, individuals were singled out in various categories from different provinces at both primary and secondary level; Edward Mufwampa (sculpture) from Chunga High, Dalson Simfukwe (drawing) from Chitanda Basic, Vasty Mwandu (Collage) Katete Secondary, Alex Makasa (drawing) Kasama Boys, Taila Fwambo (drawing) Stella Maris Convent, Joe Hachilili (sculpture) Maamba Mine, Trevor Membe (sculpture) Kyawama High, Raphael Kakinga (crafts) Kalombo Basic, Hikaaba Hikaaba (drawing) Mpika Boys and Doreen Kabwela (crafts) Roan Antelope. As earlier highlighted, the exhibition did have teething problems, but this cannot take away from the good effort and determination of the organisers and all parties involved. At least it is a start, and a big one at that. But again, there were some awkward revelations during the official opening on Tuesday. The National Visual Arts (VAC) Chairman Mulenga Chafilwa who was among the invited guests and speakers at the event used it as a platform to lobby for an audience with the new Deputy Minister of Tourism and Arts, David Phiri the guest of honour. “… to the honourable minister, I hope that one of these fine days we as practicing visual artists can be accorded an audience with you so that you can get first-hand information on how much it has been a challenge administering the visual arts and what we have achieved and what we attend to achieve in the near future,” said Chafilwa towards the end of his speech. When it was the minister’s turn to talk, just before his written speech, he responded in the affirmative saying the ministry would be happy to discuss how best the visual arts can be encompassed. “I can’t agree with you more except to say you are most welcome to come and see us, to see my minister or to see myself, any time that you may wish to see us, I’m sure the director of the National Arts Council (NAC) will be more than willing to facilitate,” he said. What is bizarre about this public reconciliation between the minister and the VAC chairman first of all is that, it exposes the fact that over a month since VAC had a ministry it can call its own, it has never been given an audience similar to the one the Zambia Association of Musicians were given courtesy of their own efforts of course, as ZAM invited the minister to an artistes' celebration of the new ministry. In addition, the NAC director the deputy minister is referring to is Victor Makashi, a prominent visual artist in his own right who should know and understand VAC’s problems and should have at least tried to facilitate an audience by now. He has direct access to the minister. In fact, on Tuesday, he was the intermediary between the organisers and the guest of honour, even opening the door the minister’s SUV as he arrived several hours late. Nevertheless, in his speech, the deputy minister commended the organisers and said the exhibition should be seen as both timely and appropriate since the arts have a ministry now and Zambia will be co-hosting the United Nations World Tourism Organisations general assembly next year. Family Cords, an on-going solo exhibition of abstract sculptures and paintings by upcoming Livingstone artist Suse Kasokota showing at the Alliance Francaise in Lusaka makes curious viewing. Almost all the paintings appear to be multi-coloured doodles of intertwined lines and orbs that seem to draw influences from Chansa Chishimba, Lawrence and Agnes Buya Yombwe, with hints of Zenzele Chulu thrown in. “I’ve come to believe that we co-exist, everything is connected so I’m talking about the co-existence of humanity, animals and plants, the different kingdoms. 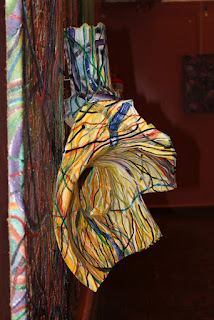 For me the cords (lines) are a connection,” says Kasokota pointing at Umuto Wa Lupwa Tawitika, the largest painting in the exhibition. Its title is derived from an age-old Bemba adage that loosely translates: “The family gravy is never spilled; when difficulties are tackled among family members they never last.” The painting’s title does not sound befitting of a work laden with innuendo as heavy as the real life toilet bowl that is attached to it hanging from the canvas; like a wall sculpture. A broken toilet bowl hanging from a canvas in a traditionally western style exhibition suggests an ‘anti-establishment’ or an ‘anti-art’ exclamation from the artist, clearly exercising his freedom of creative expression. It somehow proposes an act of insolence, as if the artist is saying “give me your gallery space, and I’ll hang a toilet on the wall” or as if he is having a go at contemporary art and gallery culture itself. Exciting indeed, this is precisely what contemporary art is about, ambiguity. Nevertheless, those are the thoughts of this writer and not the humble artist. But it is the artist’s sculptures that probably showcase his clever mind's eye. One of them entitled Wembwa wee! (You dog you) a long wooden bench tilted steeply on one side, stands several metres tall and actually looks like a dog chained to a large rock. Certainly clever, the title is from a common derogatory term again from the Bemba language. Then there is his Nyaminyami (Spirit of The Victoria Falls) named after the serpent river god of the Zambezi sacred in the traditional beliefs of the Tonga people who occupy the banks of the mighty river from where Zambia gets her name. “In this work I’m celebrating Nyaminyami because it (the spirit) brings tourists to Livingstone and also to Lake Kariba in Siavonga. Even next year it will bring them to the United Nations World Tourism General Assembly” boldly says Kasokota, despite the fact that he himself is not Tonga and this noble people were converted to Christianity by early European adventurers, or missionaries as they often called themselves, long ago. Kasokota’s rendition is made out of what looks like a huge, blackened old root that takes the winding shape of a serpent. 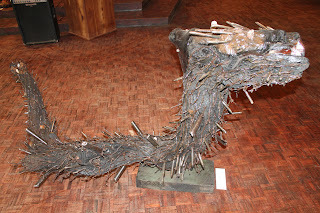 The only additions he may have made to this found piece of wood is to drive thick, highly polished metal rods and rusty barbed wire into it, finishing the serpents head off with a smooth varnish but leaving it in its rugged original form. According to tradition, the Nyaminyami has the head and upper body of a fish with long fangs and the torso of a snake. This icon is often carved into coiled amulets of wood or horn to be worn around the neck for safe passage across the waters of the Zambezi or Lake Kariba. The amulets have themselves become something of a fashion accessory and can be bought inexpensively at most crafts shops, including in the capital, Lusaka. It is said that the Nyaminyami, who occupies the Mosi oa Tunya (Victoria Falls) area as his bed space, was separated from his goddess during the construction of the Kariba Dam in Siavonga and many lives of construction workers faced the wrath of the god by death in the late 1950s. Until this day the tremors that can be felt in the area once in a while are attributed to the eternal quest for the god and goddess to re-unite. At any rate, Kasokota may just mean well to allude that Nyaminyami will provide us with a successful co-hosting of the UNWTO general assembly with Zimbabwe next year, as he along with a myriad of his comrades and the creative community doubt their inclusion in the international gathering that will only be coming to Africa for the second time. 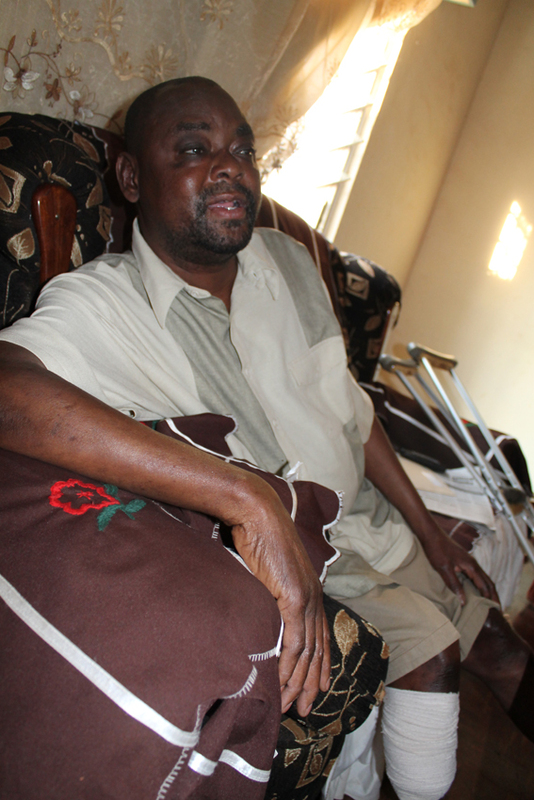 He says Zambians are very good at talking than implementing, which does bear an element of truth. But then it is good that the 32-year-old’s generation is identifying this falloff and is determined to correct it and find a way forward. His fear of Zimbabwe having an upper hand in presenting their creative side during the UNWTO general assembly is justified too, because truly, the Zimbabweans are a step ahead. Over the years Zimbabwe has produced a long list of world-famous sculptors who drawn apprentices from across the globe such as Bernard Takawira, late Henry Munyaradzi, Nicholas Mukomberenwa and Tapfuma Gutsa to name a few. Of Tapfuma Gutsa, our very own Lawrence Chikwa who exhibited at the Harare International Festival of the Arts (HIFA) last year was quoted as saying: "The conflicts of the generation gaps that we have in Zambia, I didn't see in Zimbabwe. In Harare, the conflict between senior and upcoming artists does not exist, everyone works together. I even met Tapfuma Gutsa, we spoke at length. He asked so much about Zambia and told me he studied with Flinto Chandia (a Zambian sculptor) in London during the 80s”. Zimbabwe also boasts a National Art Gallery, which of course Zambia does not have, and from the look of things may never have, due to the lack of political will. Also, we remain snug as an aesthetically blind nation whose majority cannot tell the difference between a contemporary work of art and the simplistic mimicry of handy craft. Nevertheless, we may not have the Family Cords to make the best of the UNWTO general assembly next year. But as Kasokota rightfully puts it, we have the Nyaminyami on our side, and hopefully, the world will see our creative edge next year. Suse Kasokota was born in Nchelenge, Zambia in 1979 but grew up in Livingstone where he completed his secondary education. 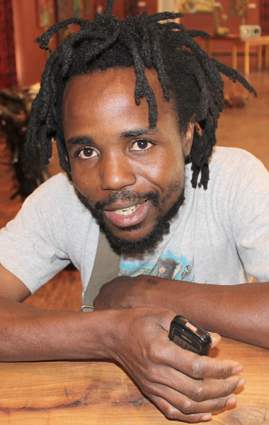 Like many young Zambian artists he is self-taught but owes much of his apprenticeship experience to art workshops in this case the Insakartists workshops in 2007 and 2008. Family Cords is showing until August 22, if you are going as a viewer, there is much to enjoy, if you are going as a collector, carry your largest cheque book, some of the works are ferociously expensive. As Zambia’s Golden jubilee draws near, Dr Kenneth Kaunda still remains the nation’s most famous and dearly loved son. 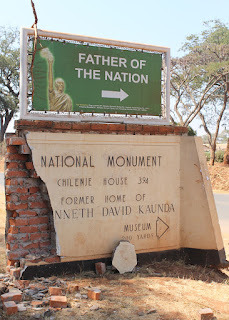 Any Zambian who has been abroad will attest that oddly, his successors, all great men in their own right are hardly recognised beyond these borders and the first question you are asked upon revealing your nationality is: “How is Kaunda?” or KK as we so fondly call him. It is not uncommon that if it is an international conference you are attending, you are quickly nicknamed after him. To many South Africans, including the ‘born frees’ (those born after the apartheid) KK is second to Mandela, and we all know how beloved Mandela is to his people and the world, why half of South Africa’s streets and city squares are named after Tata Madiba, as he is called nowadays. In fact the liberation of the entire Southern Africa is attributed by many to our own KK. A detail that Zimbabwean president Robert Mugabe re-emphasised while visiting KK at his home in Lusaka last week when he came to launch this year’s Agriculture and Commercial Show. KK is up there with Africa’s liberation greats, Nkrumah, Mwalimu Nyerere, Lumumba, Nasser and His Imperial Majesty Haile Selassie among others. KK is a superstar. But one can only wish as much could be said of his former residence, Chilenje House 394, a national monument and one of Lusaka’s few tourist attractions. Being a Zambian in a group of about 50 foreign visitors to the site recently, this writer could not help but look the other way in disgrace and hope that the others on the tour bus have not noticed the sign post on Burma Road that points to it. The sign post looks as if it was recently shelled by heavy mortar fire. It gets worse. 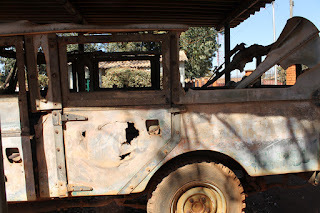 One of Chilenje House 394’s main attractions, and without doubt the most visible, an early model Land Rover given to KK by a European friend of the fight for equality Marvin Temple, a missionary is in a sorry state. 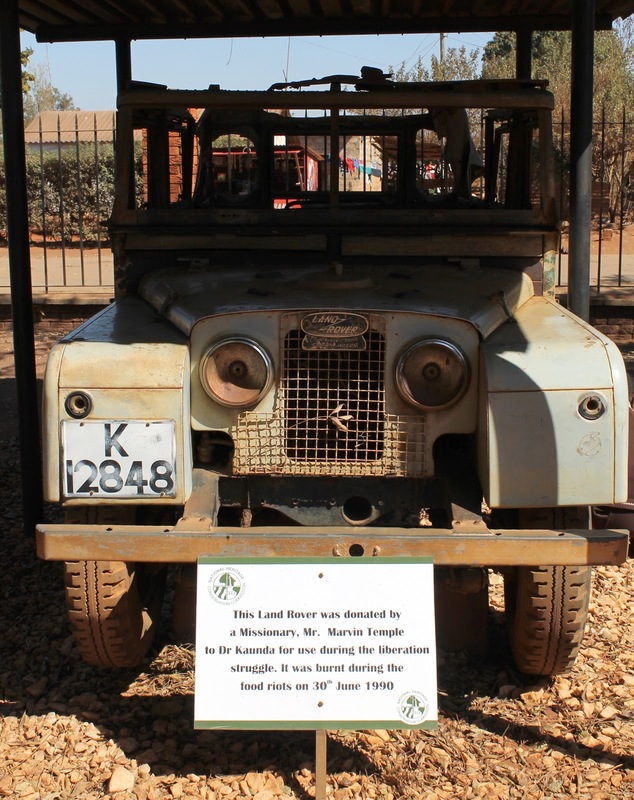 The rusty vehicle is nicely placed under a shed on a short pair of stilts with a plaque that reads: “This Land Rover was donated by a Missionary, Mr. Marvin Temple to Dr Kaunda for use during the liberation struggle. It was burnt during the food riots on 30th June 1990”. The food riots of course would be a precursor to the moment when KK would finally allow democratic advancement allowing the ushering in of the Movement for Multiparty Democracy (MMD) by popular vote. Nevertheless, there is no need to keep KKs car in its current state in memory of the food riots. After all, not even a single char shows from the said fires that scorched it. If the plaque did not say so, one cannot even tell that it had been burned by irate citizens. Retired museum director Sibanyama Mudenda concurs that there is no need to keep the car in its current state. Mudenda, who is also a consultant in cultural ecology, archaeology and culture tourism says we risk losing the car to the elements if something is not done as soon as possible. He says museums and their artefacts play a very important role, even in tourism and that it is a pity the authorities do not see this. He believes the successful co-hosting of the World Tourism Organization UNWTO 2013 General Assembly by Zambia and Zimbabwe will render international visibility to Zambia as a tourist destination of choice and will raise the country’s profile and stimulate interest in Zambia and subsequently lead to an increase in tourist arrivals. “It is unfortunate; therefore, that for the past 47 years, the state had continued to ‘put all their eggs in one basket’ Why protect wildlife resources and develop nature and hospitality tourism almost exclusively at the expense of cultural heritage and cultural tourism?” he continues. Of course by “eggs in one basket”, Mudenda cites the Mosi oa Tunya (Victoria Falls) and wildlife as Zambia’s only tourist attractions and by cultural heritage tourism he includes museums. Mudenda in any case is right. Museums can be part of a country’s tourist attractions and the authorities are not doing enough to market what we have. This author was privileged to be among a group of 50 foreign visitors to KKs former house as earlier mentioned and just the sheer excitement on the faces of these guests at having a chance to visit the site spoke volumes. 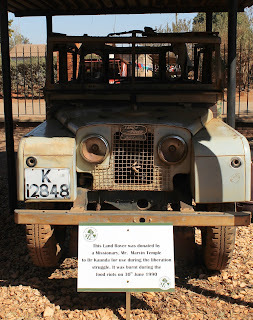 They all took out their camera phones to have their photos taken against the corroded Land Rover and quickly posted the photos on Facebook and Twitter. It is indeed a pity that our new tourism minister like all before her cannot see beyond the enchanting smoke that thunders, the Mosi oa Tunya, when there is a Land Rover among other things that needs to be restored right at her doorstep. One can even bet that she has no clue that in the vaults of Livingstone Museum lie paintings that predate David Livingstone, as Mudenda reveals. “In museums like Livingstone, artworks go back to 1750; they are locked away but are very well preserved paintings by some big names. Some of them were done by the painters who used to travel with David Livingstone and other explorers before him. 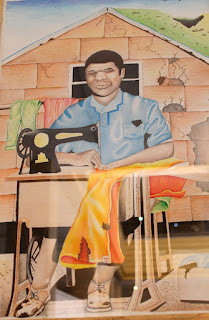 Even if they were done by colonialists they are part of Zambia’s art history. There are paintings of huge baobab trees, the falls, the landscapes all these are part of our history,” discloses Mudenda who worked at the museum for ten years before he moved to Copperbelt Museum where he served another six years, subsequently heading the Lusaka National Museum until his retirement in 2004. If Mudenda's revelations are anything to go by, it is now time for such paintings to be displayed for public consumption. They cannot be locked away forever. If the museum does not have the technology to have them displayed in fear of deterioration, the powers that be must start working towards correcting the problem. We need those paintings to be displayed in their own gallery space at the museum as soon as possible. In fact now is the best time, as we prepare to host the UNWTO general assembly next year. To have paintings that old will bring a whole new dimension and credibility to Livingstone museum. We cannot continue to sit on such treasures. In the tourism world it is a known fact that some tourists travel half way around the world just to have a glimpse of an old painting. Who knows what we are sitting on? If handled well, and Zambia announces to the world that she will be revealing 200 year old paintings that have never been seen before, Livingstone will be swarmed by art historians from all over the world. Nonetheless, back to the Land Rover. Whoever is in charge of these things, please restore KKs car. If it cannot be done locally, put it on the back of a truck and send it to Zimbabwe or South Africa if need be. US-based Zambian actress and art collector Gloria Huwiler was recently in the country mobilising support for the Ubuntu Charity Benefit, a project whose proceeds will be donated to the Russell Simmons’ Rush Philanthropic Art Foundation, a non-profit organization dedicated to empowering underrepresented visual artists. The project’s primary target is Zambian visual artists with the objective of awarding individual artists a one-year residency programme at the Rush Arts Galleries in the US. “It’s a training and educational programme as well as a huge opportunity for Zambian artists to be a part of the global movement in artistic trends and also the programme will allow the artists to exhibit for one year,” she said in an interview at Roma’s Foxdale Court in Lusaka last week. “In order to accomplish this programme we have a US$20,000 (twenty thousand dollar) goal to allow Rush Gallery to host the artist. 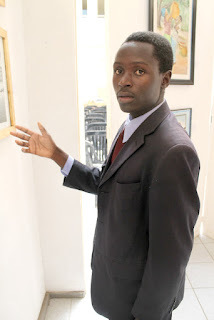 I am auctioning off my collection (of Zambian artworks) to realise the project. We are looking forward to meeting the goal, and have met about 25 per cent of it,” said Gloria working alongside co-organiser Tulsi Karpio who has worked extensively in the art and philanthropic worlds, curating and promoting Latin American Art. She said the initial sum was raised during an exhibition held at LA Artcore Gallery & Art Centre in downtown Los Angeles, in March this year that included her collection of works by Mwamba Mulangala, Stary Mwaba, Vincentio Phiri, Lutanda Mwamba, Geoffrey Phiri and William Miko which was attended by over 200 guests including Hollywood celebrities Meagan Good (Think Like A Man), actress Tatyana Ali (Love That Girl, The Young and the Restless and Fresh Prince of Bel Air), film producer Brett Ratner (Prison Break, X Men: The Last Stand and Rush Hour Series) and actor Quinton Aaron (lead male in The Blind Side). She added that Lafarge and Akasuba Projects were the only Zambian affiliated companies that helped sponsor the event. “It’s at this event that we brought Rush Gallery on board and it was also just a huge opportunity for Zambian artists to be exposed in LA because we had so many members of the press and entertainment community who now have an awareness of Zambia because we also screened the critically-acclaimed BAFTA-nominated short film Mwansa The Great by Zambian director and producer Rungano Nyoni which was well received by the audience,” she said. Gloria said she hopes to organise three more exhibitions and have an auction thereafter. When the funds are fully realised, artists will be asked to submit their entries towards the end of the year through newspaper advertisements and other media. Meanwhile, she is very excited about the creation of a Zambian arts festival in Lusaka, the Amaka Arts Festival and looks forward to collaborating with the organizers to create successful and on-going event. “It’s wonderful to have a venue for local talent to share their work, find an audience and appreciate the work of fellow artistes. A huge congratulation to the organizers on conceptualizing the festival and making this a reality for the community,” she said. The Amaka Arts Festival is scheduled to be Zambia’s first ever international multi-disciplinary arts festival and will be held in Lusaka from the 8th to the 14th of October 2012. According to the organisers, it is designed to provide an internationally recognized market to expose Zambian culture through its arts. With Dr Charlotte Scott, the Vice President of Zambia’s wife as the festivals patron, the privately organised event initially had the blessings of the Ministry of Chiefs and Traditional Affairs through the National Arts Council (NAC) a few months ago, although at this point it is still not clear to what extent the new Ministry of Tourism and Arts will embrace the well-intended undertaking. Gloria Huwiler was born into a successful business family in Lusaka, to a Swiss German father and Zambian mother. She is a stage and film actress living and working in Hollywood and pursued acting training at Oxford School of Drama (OSD), Oxfordshire in the UK after she completed school at ISL in Lusaka when she was just 17, she also studied International Relations at Brown University, Rhode Island in the US where she was an active member of the theatre and filmmaking community. Gloria has also been the face of many successful modelling campaigns. As an actress, she has participated in the theatre production Pent Up a Revenge Dance in New York with Nigerian Actress Okwui Okpokwasili. The Show went on to win a New York Dance and Performance award. She acted with fellow Zambian actor Paul de Sousa and Charles Parnell in the play Valley Song by South African playwright Athol Fugard in Los Angeles. She recently completed the short film Alone with Turkish Director Raif Kurt in Los Angeles and also stars alongside Chad Faust in Angst; a film directed by Nunzio Fazio.